You can set your course to start on a future date. You’d like to pre-sell your course and allow students to pay for it before the launch date. You’d like to have all of your students start your course at exactly the same time. You’d like to run your course multiple times per year (and have everyone start at the same time). With this feature, your students will be charged immediately after they purchase. This is different from our pre-launch feature, which simply collects email addresses of people interested in buying your course when it launches. Note: start dates only apply to students who enroll in your course themselves. if you manually enroll a student into a course, they'll get access immediately, even if the course has a start date in the future. To set a start date for your course, go to your online course’s settings and scroll down to “Start date”. Select “Add a start date” and choose the date and time you’d like the course to start. 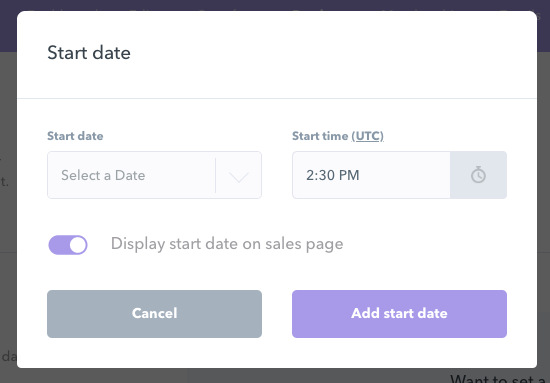 If you’d like the start date to appear on your course sales page, select “Display start date on sales page”. Select “Add start date” and that’s it! Your start date is all set. Once your start date has passed, you can add a new start date if you’d like to run your course for another group of students in the future. You can also remove a start date (and give everyone access immediately) by selecting “Remove” anytime before the start date passes. If you do this, anyone who enrolls in your course will get immediate access, and anyone who has already enrolled before the start date will get access.